Periodontal disease is unfortunately very common in our pets. There are many prophylactic measures to keep the teeth healthy, our team can help guide you as to which approaches are most suitable for you and your pet. 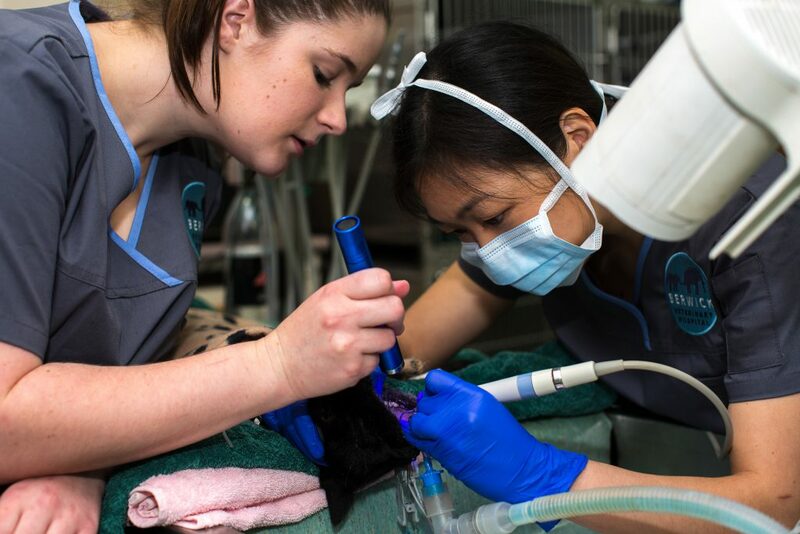 For pets in need of dental treatment, our dental suite is not only suitable for routine, prophylactic scaling and polishing but also complex surgical extractions. All pets undergoing dental care at Berwick Veterinary Hospital receive a full set of oral x-rays. Quite often this identifies disease below the gum line which would otherwise be undetected. This allows us to either institute treatment to save a tooth, or extract it before more serious problems arise. All patients undergoing any type of oral surgery receive superior pain relief. Whilst anaesthetised, patients receive a local anaesthetic to numb the area, greatly reducing pain experienced during the recovery period. All patients are discharged with additional pain relief appropriate for the procedure performed. Discharge appointments with the veterinarian or veterinary nurse will focus on post-anaesthesia aftercare, as well as ongoing dental home care to reduce the need for further treatments.